One of the most striking locations from Star Wars: The Force Awakens was the Irish island, Skellig Michael, where Rey met Luke Skywalker at the end of the film. It should come as no surprise that we'll be returning to that planet in next year's Rian Johnson directed Star Wars Episode VIII. 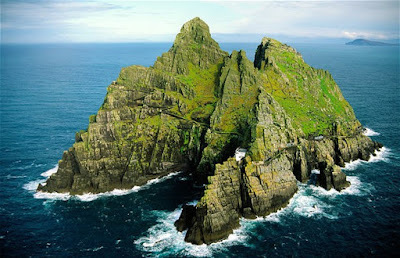 In fact, the production already returned to Skellig Michael in September 2015 to shoot scenes for Episode VIII. The Irish Star Wars podcast Blabba the Hutt are reporting that filming for Episode VIII will return to Ireland in April to shoot more scenes from that planet. However, due to the difficulties of shooting at Skellig Michael, the production will be using another location to replicate the planet. That location is Ceann Sibeal in West Kerry, nearby to Skellig Michael. It has also been reported that parts of the location have been recreated at Pinewood Studios in London. @tiger84 I have to disagree with you completely. I thought it was great. Not perfect mind you. Anything can be nitpicked. My biggest issue with complainers is the "ripoff" comments. In actuality this is done purposely and represents an old writing technique called Circle Storytelling, where the story arcs are retold yet turned on their heads with different characters thrown into similar situations.